Deutsche Bank declined to comment, but in separate remarks the bank's chief executive Josef Ackermann said it would do all it could to avoid a forced recapitalization and added it had enough funds of its own to cope with a crisis. European leaders are still discussing the recapitalization plans, with many details still subject to change, and face intense lobbying from banks and some countries who say it is too harsh. Proposals are expected to be presented to a meeting of European leaders on October 23. Note that 39% haircut figure on Greek bonds. Although up from 21% in July, it is far too low. Anything under 50% is preposterous and 80% or higher losses would not be surprising in the least. These ranges provide more questions than answers. 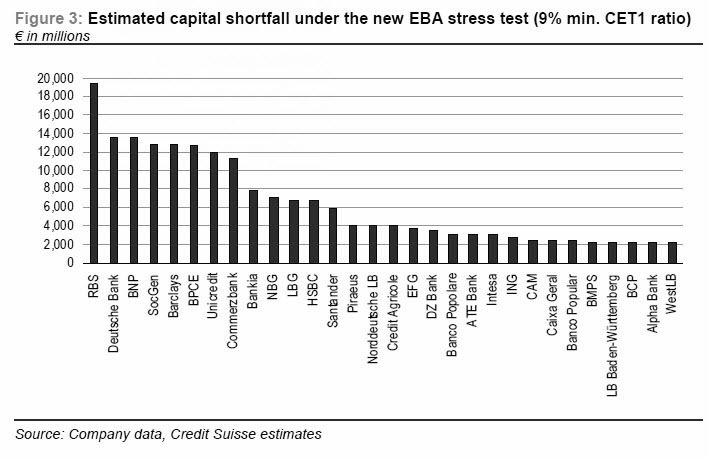 Moreover, low-end lowball estimates such as €7.6 billion by Merrill Lynch are preposterous under all but the most ludicrous scenarios in the third round of "stress-free" tests now underway. Deutsche Bank AG Chief Executive Josef Ackermann says it isn't clear recapitalization efforts will help solve the crisis. Hey, let's just not recognize any bank losses ever. Zero Hedge has some interesting charts of capital shortfalls as estimated by Credit Suisse. Commentary and charts below from Credit Suisse. No link provided. Click on charts for sharper image. One of our conclusions was that the overall European banking sector is facing a €400bn capital shortfall which compares to a current market cap of €541bn. The table below details the breakdown of our estimated capital shortfall.